Play of the Day: Just How Big Was The Republicans' Win? Midterm "flyers of shame" are the latest tactics meant to motivate citizens to the voting booth. 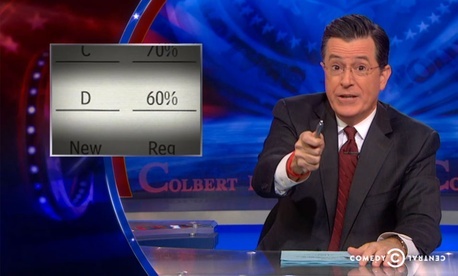 The parties have tried nearly everything to increase voter turnout, but The Colbert Report's host, Stephen Colbert, thinks this strategy could be the best one yet. Plus: Harry Reid makes a last-ditch effort to stop Americans from breaking up with the Democratic Party, and Conan O'Brien bemoans our unfortunate tendency to forget the process of voter registration.